Members of the Syrian Democratic Forces (SDF) and U.S. troops are seen during a patrol near the Turkish border in Syria's Hasakah province, Nov. 4. 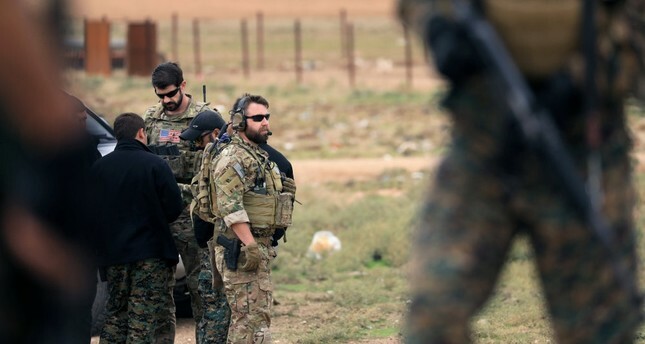 The United States' ongoing steadfast support to the PKK's Syrian affiliate the People's Protection Units (YPG) and the terrorist organization's subsequent increase in strength in the region has prompted Ankara to take necessary steps to ensure its national security. President Recep Tayyip Erdoğan announced yesterday that an operation to clear the eastern parts of the Euphrates River from terrorists will be launched in a few days. Speaking at the Turkish Defense Industry Summit held at the Beştepe Presidential Complex in the capital Ankara, Erdoğan said, "It is time to realize our decision to wipe out terror groups east of the Euphrates." "Turkey will carry out a military operation in a couple of days," the president announced. He added that the target of the operation would never be American soldiers on the ground but the terrorists. The statements by Erdoğan indicated that Turkey will not remain unfazed in the face of serious terror threats posed against the country from its Syrian border while its NATO ally, the U.S. has been providing support to the YPG under the pretext of fighting against Daesh. Even though Ankara has long called upon the U.S. to end its relations with the YPG as Daesh no longer poses a significant threat, the U.S. has persistently attempted to justify its partnership saying that they need to keep their eye on the ball, which is defeating Daesh. Yet, U.S. President Donald Trump on Tuesday acknowledged himself that there is not a substantial Daesh threat left in the region, conflicting the U.S.' own rhetoric over their partnership with the YPG. "We've done a very, very major job on Daesh. There are very few of them left in that area of the world," Trump said, adding that "within another 30 days, there won't be any of them left." "There is not a Daesh threat in Syria anymore," Erdoğan also said during his speech, stressing that Turkey will no longer tolerate terrorist activities along its border. "They are talking about a 150-kilometer zone where they [Daesh] are active. If it is about this zone, Turkey is ready to immediately eliminate any Daesh presence in the area," he said. Oytun Orhan, an expert on Syria, stated that "following the U.S.' ongoing steps supporting the YPG, it was understood that the diplomatic efforts of Ankara have not yielded any results." "I believe that Turkey's new operation might not be comprehensive compared to the previous cross-border operations such as Euphrates Shield. The new operation would focus on forming a region cleared from the YPG along the Syrian border and controlling critical points," Orhan underlined. He added that when Turkey gained control of key points it would move to extend it through the west or east. The Syria expert also said that there have been some preparations on the Turkish side of the border recently. Orhan pointed out that Tal Abyad might be one of the strategic goals of Turkey and stressed that the Free Syrian Army (FSA) might also participate in Turkey's operation. Previously, Turkey targeted the YPG in two cross-border operations, Operation Euphrates Shield launched in August 2016 and Operation Olive Branch in January 2018, as well as through air and artillery strikes. After repeated demands for Washington to end its support to the YPG, Ankara signaled that it may launch a major cross-border operation in the area stretching from the Euphrates River to the Iraqi border to clear the terrorist group from its border region. Despite its rhetoric that the ultimate goal of the U.S.' in Syria is to defeat Daesh, Washington's recent steps in Syria have been raising serious questions in Ankara about the real intentions of the U.S. In the latest move, the U.S. started to signal that it will continue to remain in Syria even after the defeat of Daesh and will form internal security forces to ensure security gains are enduring. U.S. Special Presidential Envoy for the Global Coalition to Counter Daesh Brett McGurk said yesterday that "enduring defeat of a group like this means you can't just defeat their physical space and then leave; you have to make sure the internal security forces are in place to ensure that those gains, security gains, are enduring." Answering a question about the Euphrates region, McGurk said "we went into this part of Syria because there were major threats to us, our homeland, to our partners, to neighboring states including Turkey when [Daesh] was controlling this entire area, and we were determined to clear [Daesh] out of this area so it does not have safe haven to continue to plan and plot those types of attacks." Through these actions, the U.S. has not fulfilled its so called objective is protect Turkey against the threats of Daesh, but it actually continues to create security risks for the country by replacing Daesh with the YPG, opening deep wounds in ties with Turkey. "U.S. soldiers have been placed among PKK terrorists in case Turkey uses its legitimate right of self-defense or intervention," Erdoğan said, implying that the U.S. actually aims to protect YPG terrorists and not Turkey. "They [the U.S.] said they did not supply heavy weapons when we objected to them about arming the YPG. They said they will collect the current arms after the threat of Daesh is eliminated. Who are you deceiving?" Erdoğan stressed. Disappointed by the U.S., Ankara underlined that the U.S.' moves have not been befitting the spirit of their alliance. Proving Turkey's concerns right, Joint Chiefs of Staff Chairman Joseph Dunford said on Sunday that in order to bring stability to eastern Syria, the training of 35,000-40,000 local forces should be completed, referring to the Syrian Democratic Forces (SDF), a group dominated by the YPG. Speaking at a Washington Post event, Dunford said they have only completed 20 percent of the training so far. "We are far from reaching stability [in the region] right now. For now, our existence in Syria will continue and the future of this situation will be determined according to the new circumstances," he said. Ankara has been also criticizing the U.S. on the grounds that there has not been significant progress in the Manbij deal reached with the U.S. in June. In line with the agreement, Turkey is expecting a complete withdrawal of the YPG terrorists from Manbij and its surrounding areas. "Although Manbij is made up of 80-85 percent Arabs, there are terror organizations there and they are not being honest, they still can't remove the terrorists from there. Then we will do it," Erdoğan said, referring to U.S. pledges to remove the YPG from the northern Syrian districts.